Also know as "The Forks" and by some - Indian Head, Indian Face or Sculptured Ridge. 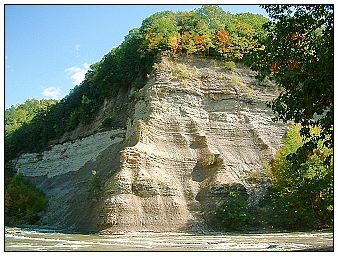 It is located at the Confluence of the main branch and the south branch of Cattaraugus Creek. It gives the Valentine Flats area its southern border and it is what makes the area special. Its shear size up close is a wonder to behold with the eyes. 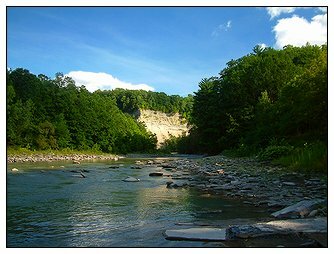 The sounds of the two creek legs coming together echoes off Martin's point. It also marks the ending point of the central peninsula. 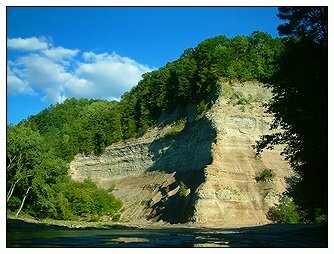 Martin's Point is one of the gems of Zoar Valley.